A number which is greater than 1 and which has no positive divisors other than 1 and itself. Sometime back I’ve written a tutorial which shows clearly if provided number is prime or not. Scanner class constructs a new Scanner that produces values scanned from the specified input stream. checkIfPrimeNumber() is a method to find out if number is prime or not? 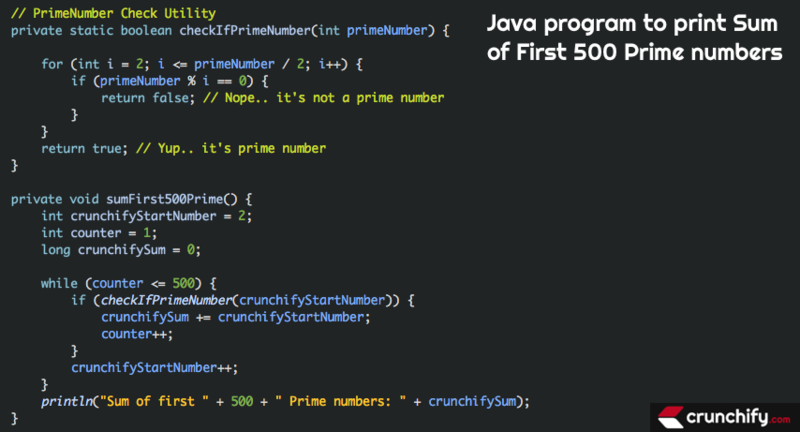 Here is a complete Java program to print sum of first 500 prime numbers. Why is the number 1 not a prime number? As per a Prime number definition, Prime number is a number which is always greater than 1. Number 3 and 5 are prime numbers as both numbers divided by itself and 1. A whole number that can be divided evenly by numbers other than 1 or itself is called Composite Number.